Thread: Scrappy and White 9 Patch Block Swap... signups close Sept 20! Blocks due by Oct. 10. 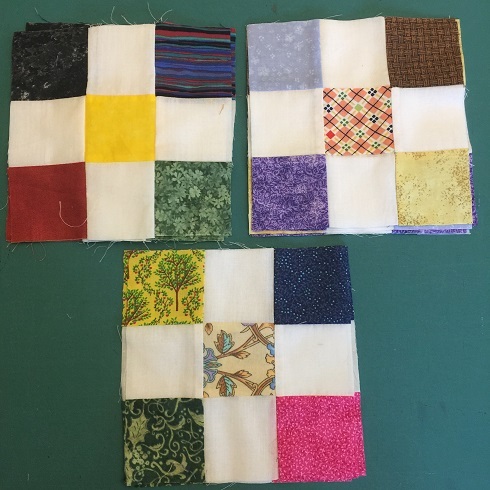 Join us for a new and different 9 Patch Block Swap, a very fun way to use up your scraps! Please read this entire post! The blocks are different than the last two 9P swaps. If you send the wrong blocks, I can't swap them and will have to return them to you. Read the rules. Sign ups are open until Sept 20. Blocks must be here in my hands no later than Oct 10. You will need quart size bags (not sandwich) to accommodate the size of the blocks. Please put your board name on each bag. Before mailing, put all your bags into a big gallon bag with your name and address clearly on the bag, along with your board name. Then ship in either a tyvek or padded flat rate envelope. No paper envelopes, as they don’t hold up. Be sure to include your return postage! It’s $7.25 now for the padded flat rate envelopes I will use for U.S. shipping. I will not be making change this time, so if you send $8 or $10 I will consider it a donation towards the printer ink and tape fund. Do not send me stamps or stamped envelopes! My P.O. requires that I check those in, in person, at the post office counter, and I am not going to the post office. I make my labels online and mail from home. So send carefully concealed cash in your package. I've never had a problem with that yet. Sign up by pm’ing me your real name and address, and your email address. Please read the next post for tips on getting a 6.5" square! Many of you are pros at making perfect 9 patches, but for those who struggle, I have some tips. Blocks must be 6.5" square to be eligible for this swap (so they fit with everyone else's... ), and not just because I am mean. So how do we get that? Start by squaring off a straight cut across your fabric or scrap. When you cut your 2.5" strips or squares, pay attention that your ruler line is on the fabric, not the mat. Then get your true 2.5" cut. I have found that I have to sew a scant quarter inch seam. If I sew a full 1/4, my blocks come out too small. Every time. I have a scant quarter foot on my Juki that I use, but if you machine does not, you need to experiment and find a line on your machine bed, or place a piece of tape where that scant quarter line is. Then follow it! After sewing, I press to the dark, and my little checkerboard 9-patch will have beautifully nesting seams. I also check to see that the center block or strip is measuring exactly 2", as it should. When cross cutting strip sets, again square off a straight line perpendicular to the long edges and measure from there, with the ruler line again on the fabric and not the mat. There are online tutes about how to spin seams at your four intersections, if you need them. It is not required that you spin your seams. Lastly, take your 6.5" ruler and place it on your pressed block and sliver trim the edges. If something doesn't quite reach the 6.5" edge, you may have to pick open a couple of little seams and alter them slightly. You wouldn't believe how often I do this, so I can send the right size block. Remember, 6.5"... not 6.25" or 6.75" or 6.5"x 6.25". I wouldn't miss this for the world, count me in! Sending my pm. Whoopie! Another round of 9-patches! I just send my PM. Thank you for hosting again, Sewbiz! Ok, we have three already! Four, including me. When we have 10 or so I will start posting the list. Let the block making begin! Oh! This will be a fun thread to read! Invite all your friends to join! :-) There are so many many many ways to use 6" (finished) 9patches! Yes, yes - count me in! Hope to complete 50 - using Kona white. Yes I'm in too! I already have about 50 done using Kona white. And I'm measuring every which way possible! This sounds like a fun swap. Does anyone have quilt examples on how they have used these 9 patches? Jannie, there are so many ways to use these blocks! You can look through the past two 9-patch blocks swaps Sewbizgirl has hosted this year to see what other members have created. Or you can go on Pinterest or Google and simply type in " nine patch quilts ". There is the Single Irish Chain pattern, the Sisters Choice pattern, Snow Balls and 9-patches, on point layout, and many more... So many ideas! Hope you join us! Last edited by NZquilter; 09-01-2018 at 06:40 AM. I was planning on using mine in an Irish Chain, too. I really like that one with the alternate friendship stars! It's a fun quilt that really lends itself to scraps. 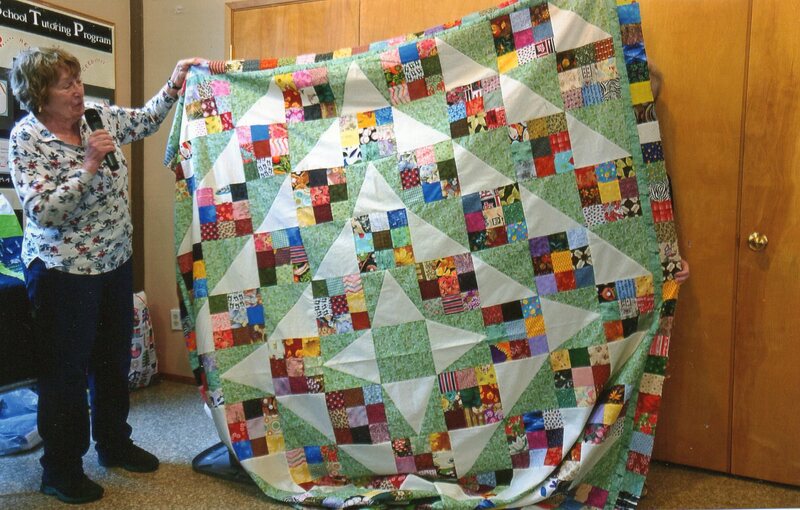 NZQ, that is a pretty quilt, love that variation! I want to do this swap, have to purchase Kona fabric before I PM you though. Can anyone tell me how much fabric I should buy? Just taking a wild guess... but maybe a yard or yard and a half? Sunrise, I'm finding I am getting approximately 50 9-patch blocks out of 1yd. I liked the feel and weight and the weave of the Walmart Waverly 100% cotton white carried at my local Wally-world. I know not every Walmart is the same, but my one sells fabric by the one yard bundle, so I bought two of them. Hopefully no one minds that I'm not buying Kona cotton? Last edited by NZquilter; 09-01-2018 at 03:13 PM. generally speaking you can cut 15-17 2.5" squares from a width of fabric depending on how wide it is . Oh, absolutely not! It’s up to you to decide what to use. There’s no requirement to use Kona. I just ask that your fabrics not be too thin. I’m sure we will end up with a nice mix of fabrics. Count me in. I hav e been waiting for this swap. I will PM you. I will be making an irish chain pattern. I love scrappy Irish Chain. Here are a few blocks I have started on. 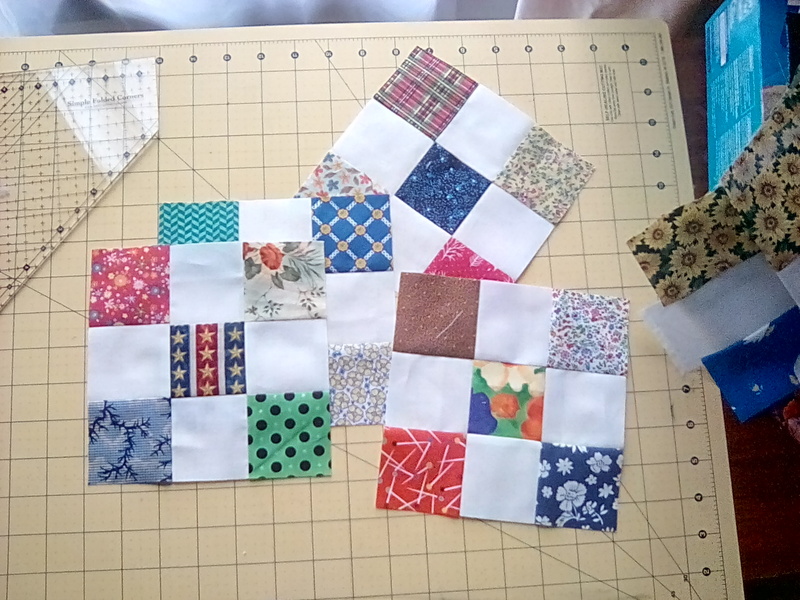 I have so many small odd shaped scraps that I am cutting into 2.5" squares for these blocks... This may take awhile! But it couldn't be a funner way to use them up. Pretty quilt, Mim! Several of us used that very same pattern with our blocks from the last 9p swap! We had two red ones, and a blue. I love that pattern. And sorry to hear about the shingles. NZ, great start on some very pretty blocks! Thank you for the pictures, ladies. I made my blocks several weeks ago, but it looks like I'll have to sit this one out after all. Hubby's work hours are being significantly cut, which means that "play money" will be pretty much non-existent for awhile. If things change before the sign-up deadline, I'll definitely join if I can, but for the moment, I'm having to cut way back on my swaps. Oh, that's sad... especially since you've already made your blocks. That darn postage is expensive! Maybe you can sew along with us, Moon, and show us what you are making... even if you don't end up swapping. Hope things pick up for you and your husband.